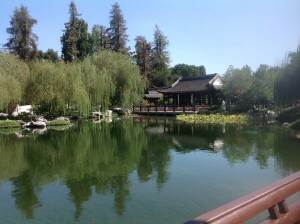 The Huntington constructed this part of the garden after the deaths of Vincent and Delcina Beckford. So they never saw it. But they would have loved it. Mother Nature uses the heuristic approach. Try it, you may like it. And if you do not like it then throw it away and try another one. And then another one. As a matter of fact, make a whole bunch of them and select the best for a while but make more and count on “built in obsolescence.” Thomas Edison is famous for this heuristic approach (when it comes to education, discovery and invention). My Mother was like Mother Nature. She could not stand the “back and shunting” of Daddy. (That was her phrase for plausible procrastination!) Daddy would measure twice and cut once. It took forever for him to write a letter. But when it was done it was a work of art. You could not throw it away…unless you were Mother, and even then… well, it was so beautiful. It was modern calligraphy. Or modern English hieroglyphics. That is why Jimmy Fleming, on the Los Angeles Cricket Club, called him The Scribe. Yes, it was an apt title. His progeny adopted the title. He was Daddy, The Man, and also The Scribe. But he was also Skip or Skipper from his days of being captain of his cricket team and his soccer team. But only Mother called him Skip or Skipper. I did not know him in those days when he was the young athlete. To me he was Daddy and The Scribe. Names of Respect and affection. Calling V.H.B. 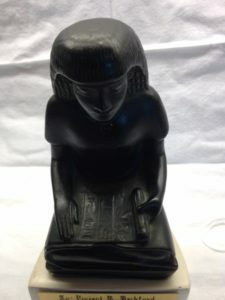 “The Scribe” was a sign of veneration and respect. Vincent Beckford thought his son, the doctor, had bad hand writing. Daddy, like so many others, thought he could teach a doctor how to write well. “Measure twice…” First sit down and have good posture! Be sure your elbow is resting on the table! (Table? I’ve got to find a table to write my note? What if there is no table?) Sit properly! (You have got to be kidding, right?) Pivoting with the elbow, measure out the line of writing by writing in the air above the paper so that the actual writing will not look cramped. While writing with the entire forearm and hand as a unit, the wrist and the fingers need not move. That was good advice. I’ve confirmed it recently. 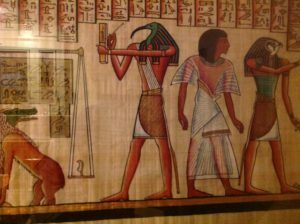 Even Toth the ibis headed Egyptian god of writing (and science) is pictured as standing while carrying out his role as court reporter on judgment day. There is no table and his elbow is resting on air. He is writing with wrist motion. That is the reason for my bad handwriting! I bet Toth had bad hand writing too. 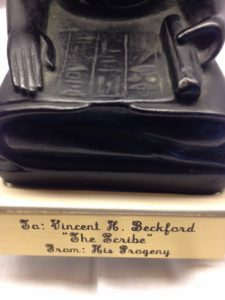 No wonder we couldn’t read hieroglyphics. Hieroglyphics might have been Toth’s attempt to write in English and maybe he just set a bad example that all the scribes copied faithfully!!!! Maybe they could not read hieroglyphics either. Or not. English actually would have to wait a few thousand years to be invented. Anyway, it looks like maybe Toth was using an ancient iPad and a modern Stylus pen that he bought from the EdFund Store. Or not. But he is a god and what is time to him anyway. With that pen he was probably really holding infinity in his palm and eternity in an hour. He is like a photon. To him, everything happens at the same time. All eternity is an instant. Mother. The Scribe called her Deli. Only The Scribe called her that. Mother, Aunt Delcina and Sister Beckford and Mrs. Beckford were the only other names that I heard her being called. But I am sure that her sisters probably called her Delcina. She called her siblings by their first names. Winfield. Hazel. Edith. Dorothy. Nobody called her anything like The Scribe or even the Scribess or Scribina or Scribette. For her, time was of the essence. She moved fast but she was not a photon. Time mattered to her. There was to be no “back and shunting” for writing a message. Get it done fast and if you don’t like it do another one, quickly. It is not an art contest; it is a message. In their seven decades of marriage, they maintained a basic philosophical difference. The Scribe was a rational philosopher with a carpenter’s approach to life. Careful. Measured and planned. Mother was the empiricist and therefore the risk taker. But together they raised a family by making compromises and by using blended approaches. I have been identified as a rational-empiricist by Dr. Kurt Tauber, my Williams College philosophy professor. I gladly accept that attempt to pigeonhole me only because it is true and reflects my parents and my wider cultural heritage. My father, the Scribe, got his college degree in his youth and my Mother got hers in middle age. He was on the governmental team that provided Clean Water for the city of Kingston when we lived in Jamaica. They both valued education and operated a private school called the Maynard Fundamental Institute for two decades in Southern California. They loved the Huntington Library & Botanical Gardens in San Marino, California. As immigrants to America they had to take jobs of lower status than they had in Jamaica. But they did this to improve the educational opportunities for their four children. All four children are college graduates and two have entered the teaching profession. Three of them have good hand writing. 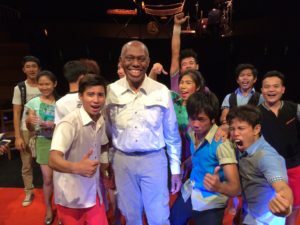 Vincent Beckford loved the song “Land of Hope and Glory” so this is an adaptation of an excerpt from it. The song is British in origin but Delcina lived it out as if it referred to the America to which we had migrated. We once were British subjects but became proud American Citizens although we remain proud of our heritage. Jamaican, Panamanian and Barbadian. Delcina, with her risk taking heuristic view, imbued us with the entrepreneurial spirit that has driven three of the four into businesses. One child, Audley, became a printer which I believe was the modern version a scribe. He was also the athletic star of the family. Audley scored centuries and/or near centuries playing cricket in the day when such a performance was unusual. He and Linden played against Tony Verity of University Cricket Club. My pathology professor at UCLA School of Medicine, Dr. Anthony Verity was the same Verity that I had heard about from my father, then an umpire, when he and my older brothers came home from hotly contested cricket matches with the University Cricket team as they sought victory for their Los Angeles Cricket team in the Southern California Cricket Association. The systematic approach for which Dr. Anthony Verity is famous and that he used in developing cricket organizations in the USA is similar to the systematic approach used by Vincent H. Beckford. Both men were immigrants to California from the British Empire in the year 1959. My siblings Linden and Nelsa have seen many of their students go on to academic success. So had Delcina. Vincent & Delcina used different approaches to solve problems but they worked together for similar goals. They valued education both mental and physical. They also valued health. 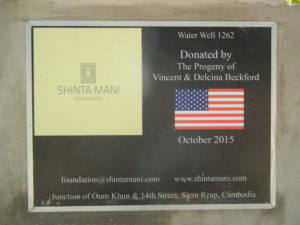 There are now two fresh water wells in Cambodia dedicated in their honor. 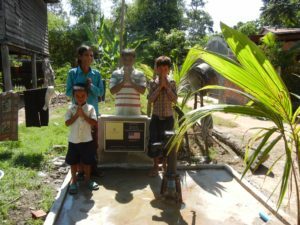 They may never see the healthy Cambodian children who will achieve academically because their physical health has been protected by clean water. These wells bring clean healthy water to two rural families so that the children can grow up healthy and take advantage of the educational opportunities available. Toxic water, as we see in Flint, Michigan, not only threatens life but also impairs learning. 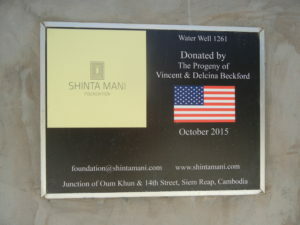 Clean & Safe Water supply in Flint, Michigan and in Cambodia. That is what we need. Vincent H. Beckford would not play with the people’s water supply. In Jamaica he was part of the team in charge of the clean water supply to the capital city, Kingston. He understood that with water supply it is not the time nor place to follow the heuristic approach. Too much is at stake. Rational analysis, careful planning and full deliberation is what is needed. “Backing and shunting” is important here! Measuring twice before cutting is the rule when it comes to the health of the people. Even Delcina recognized this. She had a statement about how to approach food when its safety is questionable. “When in doubt, throw it out.” Fast and simple. Neither Vincent nor Delcina would have tolerated the hasty and bad decision in Flint followed by the failure to throw out the bad water two years ago when there was sufficient doubt. The Maynard Beckford Institute for Scholarship and Education (MBISE) intends to expand the cultural influence of Vincent and Delcina Beckford by encouraging the support and utility of scholarship and education globally. 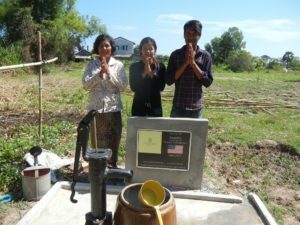 We are collaborative and have worked with community organizations in Cambodia (Shinta Mani) and in the US State of Georgia (PSCCA-EF). We are both practical and theoretical. We know just how important clean water is to a community. We have praised the Atlanta Based Carter Center for its effort to eradicate Dracunculiasis and provide safe water for children. Oh. One more thing. After realizing that I no longer have an excuse for my bad handwriting other than deteriorating health, I have decided to follow The Scribe’s advice on a heuristic basis. If my handwriting becomes beautiful I will post the after images. But not the before images of my handwriting… This might be revolutionary. A son who actually listens to his father. It is never too late. Oh well, yet one more thing. (Remember, there were two wells.) Mother did not slavishly follow her own advice. She did shop for expensive high quality furniture and also sometimes expensive but always high quality clothes. Something about maintaining the Maynard standard from Canal Zone days. Sometimes quality is more important than quantity. Sort of.